In the near future, 86-year-old Marjorie (Lois Smith) is suffering from dementia. Despite the misgivings of her daughter Tess (Geena Davis), Marjorie’s son-in-law, Jon (Tim Robbins), has arranged for Marjorie to have a handsome new AI companion - who looks like her deceased husband, Walter (Jon Hamm), and is programmed to remember her memories and feed the story of her life back to her. Think about science fiction films and shiny spaceships filled with funky gadgets often come to mind. However, this genre also features many smaller, more intimate movies - insightful films that investigate the human condition. Marjorie Prime is (forgive me) a prime example of this type of science fiction movie. Based on the play by Jordan Harrison, this is a thought-provoking story that explores how our memories define our identity and sense of self - even if these recollections are not entirely reliable. Suffering with the early stages of dementia, memories prove both a comfort and a torment to Marjorie. As she starts to lose her memories, will she also lose herself? Her near future society has a potential solution - a computer generated hologram, called a Prime, of her dead husband (a younger version of Walter that she has unfinished business with). This AI Walter has the ability to learn and retain information about Marjorie’s life and recollect her memories when she cannot. The Prime concept is both inspiring and disturbing. Marjorie knows that this isn’t her real husband back from the dead. She points out the differences between the two and the gaps in the Prime's knowledge (leading him to utter the rather chilling line: “Great, I’ll remember that now”.) Nonetheless, she takes great comfort from his presence. The film becomes increasingly unsettling as it explores the potential of artificial intelligence and questions what it means when computers become almost as human as humans (a theme also found in Blade Runner 2049). Marjorie’s daughter Tess and son-in-law, Jon, further develop these themes in the movie. Tess is deeply suspicious of the AI version of her father - particularly when the information he is given leaves out some of the darker, more painful details of her family’s past. Meanwhile, Jon truly believes in the potential of the Prime concept. He enjoys the process of programming and updating Walter Prime. However, even he comes to find the technology lacking and frustrating. Marjorie Prime's thought-provoking themes are brilliantly portrayed by a superb cast. Geena Davis and Tim Robbins give powerful portrayals of Tess and Jon. Meanwhile, Jon Hamm is extremely impressive as AI Walter. However, the heart and soul of Marjorie Prime lies with Lois Smith’s performance. Having portrayed Marjorie in the stage version of Marjorie Prime, Smith knows her character extremely well. Indeed, it was Smith who brought the story to the attention of director, Michael Almereyda. Almereyda’s restrained adaptation. The director pared down the play’s dialogue and eliminated characters who never appear on stage. In addition, Almereyda added new locations, included memory flashbacks (allowing us to see the human Walter) and further explored how technology could transcend the bounds of time. 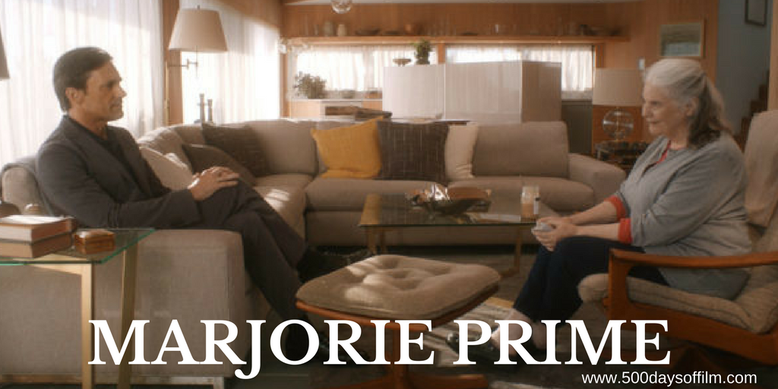 Like all good science fiction stories, Marjorie Prime is a film that stays with you - urging you to consider just what it is that makes us human. Have you seen Marjorie Prime?